Ars is character (pl. ), method, way or skill/craft/art to name a few definitions. Lyrica or lyric, rounds out an amazing Houston Grammy–nominated ensemble dedicated to providing audiences with historically-informed performances, of the highest caliber, of music from the 17th and 18th centuries. Ars Lyrica, which means “lyric art,“ performs on period instruments to produce livelier, more intimate sounds than modern equivalents and are better suited to the performance of Baroque music. Mr. Matthew Dirst, Artistic Director, completed the celebration of 10 years of unique concerts by guiding three amazing soloists for an exquisite merging with the incredible ensemble, providing music for the fortunate audience members. The soloists, Canadian soprano Meghan Lindsay, Baroque flautist Colin St. Martin (played traverso) and baroque oboe and recorder professional Kathryn Montoya shared their exquisite talent through the music of J.S. Bach, Telemann, Pachelbel and G.F. Handel. We learned after the intermission there were some newlyweds in the audience. 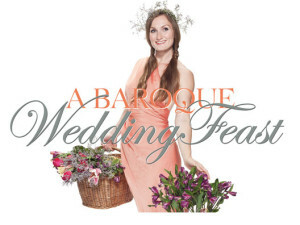 Prior to the concert, Professor Tanya Kevorkian (Millersville University) informed us on the background and progression of the Baroque wedding People had few occasions to celebrate, so weddings were THE social event in villages and larger cities, with the length and breadth varying as weddings today. This 1600’s actually had ordinances against having fun! However, one wedding celebration shared was two weeks in length, with operas and other music written especially for the special couple. Music was a special part of weddings. Most weddings were between Lent and Advent, as there was ‘no music’ during these religious seasons. The sound system for speaking presents a challenge for listeners. Musicians like to perform, so sometimes speak rapidly or softly, compounding the challenge of understanding by the audience. Director Dirst (harpsichord & organ) gathered creative, vibrant musicians of the violin, viola, viola da gamba, cello, violone and theorbo who accompanied, soloed, and transported the audience with their skill and expertise. The minute you’re in the Zilka Hall lobby, the friendliness of the Ars Lyrica staff confirms you made the right choice to attend. The leadership team interacted with most of the ‘guests’ while waiting for the pre concert lecturer to arrive. The dress of the event ranged from elegant to casual for the audience. The male (9) and female (4) performers each reflected their unique personality with their choice of apparel. Soprano Meghan’s lyrical, expressive performance was enhanced by the hall’s acoustics. Her BCBD Tasha Strapless royal blue dress stole the show. The stage was dressed in the remarkable John Phillips Florentine-style harpsichord, Bennett-Guittari continuo organ and period instruments. Staging varied with each composer, mixing it up to keep everyone interested. The string and wind instrumentalists who stood (not cello, viola da gamba, viola sometimes, violone, theorbo and keyboards) instrumentalists not performing would sit in the back of the stage enjoying listening to their peers. The energy level was high on stage at all times, either performing, restaging for the next piece, tuning the harpsichord and other instruments or taking bows for a remarkable job. Telemann’s concerto offered perfect staging for the dexterity, tone and expression of the two guest instrumentalists. Following the intermission the ‘greatest hits’ of the ensemble – music most requested for them to play for weddings – offered a different taste of the Pachelbel Canon (round) & Gigue (dance) with an arrangement highlighting the lower register strings. G.F. Handel’s “Water Music” and “Music for the Royal Fireworks” had us on the bank seeing the barge of the king. The bad news is the season is over. The good news is the 2014/15 season is out – The Power of Music – with a great New Year’s Eve opportunity for those of you who can’t make it to some of the other concerts. Check it out, www.arslyrichouston.org. Is better than even nature’s delights.